At first glance, I thought Aukey had sent me a grown-up version of the Altec Lansing Mini Lifejacket III Bluetooth speaker by mistake. Aukey’s SK-M12 wireless outdoor speaker is larger, but it delivers the same clear sound, and it has the same bolt-hole mount for attachment to your bicycle or whatever. Aukey takes things a step further by adding oomph in the bass-response department. I wouldn’t call it kickin’, but there’s enough that you won’t start missing it. This is the Bluetooth speaker I’d be most likely to take to the beach. One thing that delighted me was the speed of the SK-M12’s Bluetooth pairing. 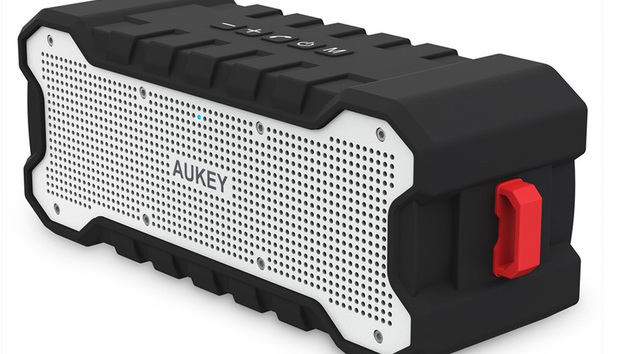 Pairing Bluetooth speakers is often a ponderous process, but Aukey's speaker appeared almost immediately and then paired up in about five seconds. I paired the SK-M12 with a Lumia 930 Windows phone, a late-generation iPad, and a Motorola Droid and had the same experience. The other great thing about how Aukey handles Bluetooth pairing is that it's automatic--no pressing of buttons required; in fact, there isn’t a dedicated Bluetooth button. You just power it on and it starts listening (as long as nothing is plugged into the 3.5-mm analog input that is). This MO makes so much sense that it’s hard to imagine why other vendors don’t do it this way. Okay, so someone can steal your pairing. Fun around the campfire. Throw a marshmallow at them. With the exception of the “missing” Bluetooth key, the Aukey sports the usual array of controls: Power, plus and minus, phone, and an M key, which the user’s guide pegs as “Menu.” Short presses on the plus and minus buttons change tracks, while long presses raise and lower the volume. The phone button answers and hangs up the phone. Most intuitively (I kid), the menu button adds bass boost. So let’s call it the More (or less) button. Without the boost, that oomph I rattled on about disappears. I left it on, but I can see where phone calls might be clearer with it off. Breakdown of the Aukey’s buttons and ports. There’s a single multi-function status light on the speaker grill. It’s red when charging, blinking red when low on juice, solid blue/red when paired and connected, and blinking blue/red when searching for pairing. When the unit’s off and on AC power, the light goes out to indicate you’re fully charged. Resplendent in black (the rubberized coating) and silver (the speaker and back grills), with red highlights, the Aukey SK-M12 is what I’d call industrial in appearance. Except for the fact that the grill silhouette somewhat resembles a Milkbone or chew toy. If this were a micro-speaker, I’d keep it out of reach of my dogs. The aforementioned audio input, as well as the micro-USB port, are beneath a rubber plug (red highlight #1) on one end of the Aukey, and there’s a plastic loop on the other end (red highlight #2) for hanging the speaker. I found the rubber plug a bit difficult to remove. Anyone with slightly longer finger nails won’t have a problem, but I needed a prying implement. That’s probably a good thing, and it bodes well for survival in wet conditions. Speaking of which, the Aukey is weatherized (the black rubber again), and seems to be weatherized quite well. Still, according to the company, you shouldn’t take it in the tub, pool, or lake with you, though it’ll survive well enough alongside and in the rain. I took the company at its word and didn’t submerge it. 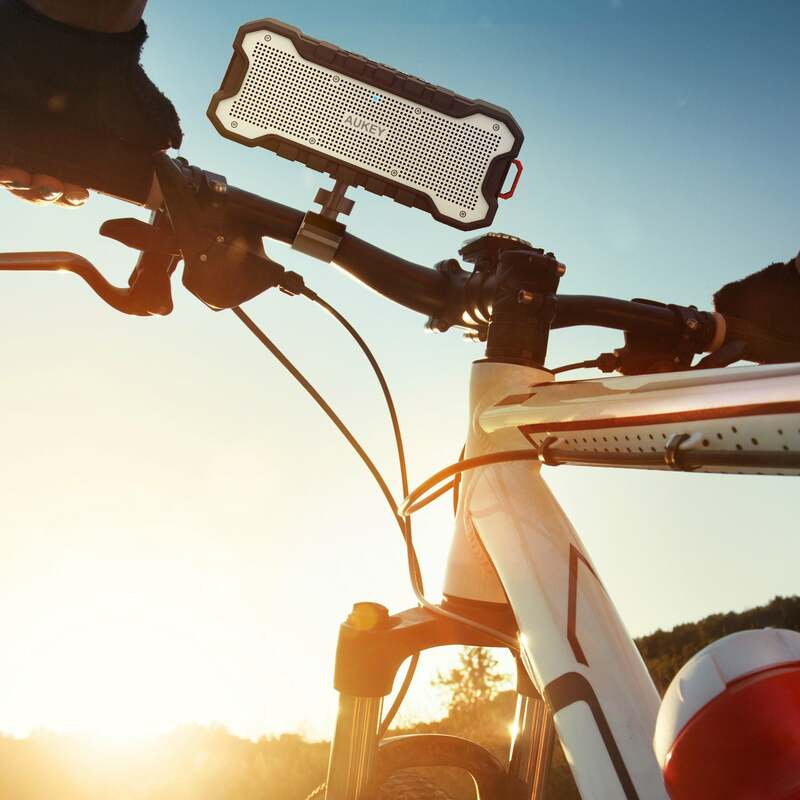 Aukey’s speaker has a threaded mount, so you can attach it to your bicycle and spoil the serene symphony of nature with your own noise. I did encounter one issue with the Aukey: its USB port is recessed just a hair further than most. The cable Aukey provided has a slightly longer-than-typical blade, but many of my USB-to-micro-USB cables wouldn’t mate tightly enough to stay put. Don’t lose the one Aukey provides. Aukey claims 30 hours of battery life for the SK-M12, which kind of makes testing a pain. Do you want to sit and listen to a speaker for 30 hours? Neither do I, but I did run it on battery power for almost an entire day and it was still going. As I’ve already discussed, the Aukey SK-M12 has very good sound for a Bluetooth speaker: Clear, loud, and with a decent amount of bass. It’s not audiophile quality, but it’s good. Unfortunately, the speaker does not support True Wireless Stereo for use as a left or right speaker in a stereo pair. But the separation isn’t as muddled as with many of its competitors; i.e., you can hear left and right channels. I’ve done Aukey a disservice by mentioning the Altec-Lansing Mini LIfejacket III (there I go again) speaker so much. Though it lacks the mounting hardware of its smaller rival, I think the Aukey SK-M12 is the better product, if not as conveniently sized for a backpack. In the end, it shone in my tortuous “friends” test. Said test being to play the speaker for my friends, and see if anyone asks if they can have it. They did. I kept it.